In 1979, a year after joining the staff of the Bureau of Economic Geology, Edward “Eddie” Collins took a boat trip down the Trinity River with then-colleague Dave Hobday. Their mission: find out if East Texas salt domes could be a safe place to store radioactive waste, or if there were signs of recent geological activity that would nix the domes as a potential storage spot. They found small-scale faults in terrace sand and gravel overlying faulted bedrock along the riverbank, a sign that the area had been more geologically active than previously thought. But that wasn’t all they found. As the team’s boat moved along the river they encountered an abundance of snakes. “More snakes than I have seen in Africa and Australia combined,” wrote Hobday in a collection of memoirs by bureau staff about Collins. That canoe trip kicked off Collins’ long career of conducting field research across Texas — and all that comes with it. During his 40 years at the bureau, Collins has done geologic work in 182 of the state’s 254 counties and made a name for himself as a great geologic mapper. Retiring in July 2018, Collins said that studying and documenting the details of Texas geology — from the beaches of the Gulf to the Panhandle plains — became his mission and the common thread binding his eclectic career together. “My BEG career seems to be linked to a lot of Texas’ geology, a variety of long and short projects, a continual learning about geology, and a lot of geologists to learn from,” he said. Collins first joined the bureau as part of the East Texas radioactive storage mission, which included that field campaign down the Trinity River. He came well-grounded in field methods. As part of his master’s thesis work at Stephen F. Austin University, he spent three months in the Llano Uplift conducting detailed mapping, interpreting aerial photography, and verifying the features on the ground, plus follow-up lab work and analyses. Although Collins’ work was field-focused, he first got hooked on geology in the classroom, crediting his first general geology course and the engaging Trinity University professor who taught it, Ed Roy, with inspiring him to pursue a career as a geologist. Collins authored or co-authored dozens of geologic maps at the bureau. From the late 1970s to the 1980s, the mapping focused on geologic features around the state that could potentially serve as long-term storage sites for radioactive wastes. 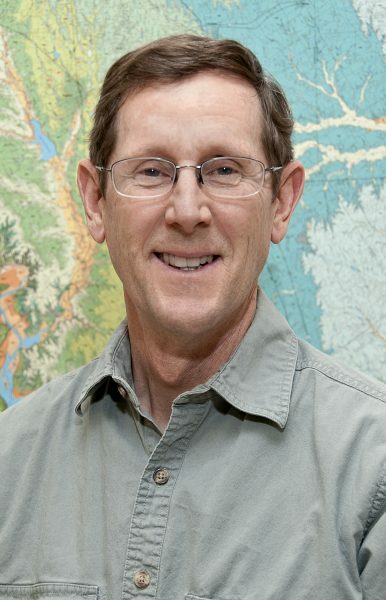 In 1992, he became the coordinator of the Texas branch of STATEMAP, a national program dedicated to creating new geologic maps across the country. Collins’ work led to the creation of numerous maps targeting areas of environmental importance, especially urban corridors and aquifers. He also counts mapping parts of Big Bend National Park from 2003 to 2009 among his career highlights. Collins’ maps are a huge contribution toward understanding the geology of the Lone Star State, said Charles “Chock” Woodruff, a geologist at the bureau who frequently collaborated with Collins and co-authored six field guides with him. from most others is his eagerness to put his shovel to work to check and see. “He engages the outcrop with what I would call aggressive physicality,” Woodruff said. One such instance happened along the Pedernales River at Hammett’s Crossing, the home of the Hammett Shale. As Woodruff recounts in the memoir collection, the namesake-shale appeared to be missing from the site. All they saw was sandstone and limestone — that is, until Collins started digging. “He exhumed the Hammett Shale,” wrote Woodruff. Spending large parts of his career in the field, Collins knows that even the best plans come with detours or unexpected events — from those hordes of snakes, to hungry coyotes eying a campfire cookout, to flat tires in the desert. When it comes to retirement, he said that he’s taking his time to get the lay of the land.